Alzarri Shaheim Joseph, the West Indian Cricketer, was born on 20th November, 1996, in Antigua. He is a right hand medium pace bowler and right hand lower order bowler. He plays for the Leeward Islands, St Kitts and Nevis Patriots and the Windies. Joseph made his first-class debut for Leeward Islands against Windward Islands in a 4-day match in 2014. In the following season, he picked his first 5 wicket haul against Guyana. He ended with the figures of 5/99. In the very next match he picked his career best figures of 7/46 against Windward Islands. 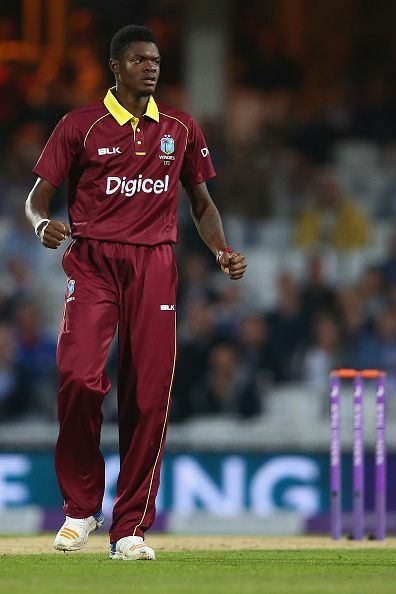 After these performances he was named in the West Indies’ Under 19 squad for the 2016 World Cup. In the tournament Joseph took a total of 13 wickets in 6 matches and was 3rd highest wicket-taker in the tournament, as the Windies won the tournament, beating India in the final at Dhaka. His performances earned him a place in the National team. Joseph made his Test debut for West Indies against India in 2016. He picked 3 wickets in the 1st innings and went wicketless in the 2nd innings in that Test. Joseph made his ODI debut for West Indies against Pakistan in October 2016 during the 2nd ODI in the UAE. He picked 2 wickets in 10 overs and conceded 62 runs. Pakistan won the match by 59 runs. Joseph played impressively for the national side and picked his first international 5 wicket haul against England. He ended the match with the figures of 5/56. He has totally picked 23 wickets in 14 matches with an average of 30. Joseph represents Leeward Islands in the first class from 2014. He also represents St Kitts and Nevis Patriots in the Caribbean Premier League from 2016.